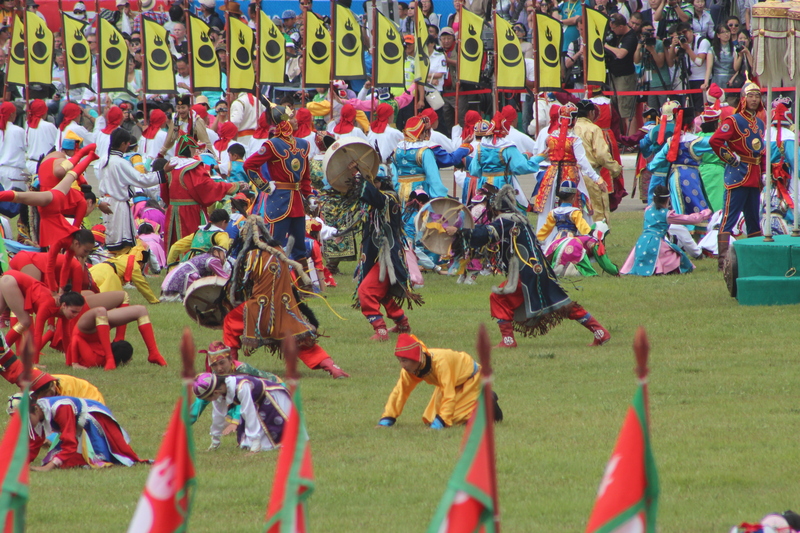 The Naadam Festival is a national festival held from July 11th – 13th. 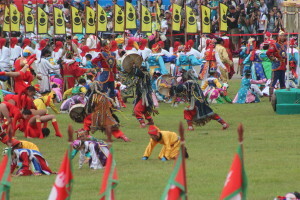 (Most of activities are on 11th and 12th) While the festival is held throughout the country, the main festival is in the capital, Ulaanbaatar. Before I go into the four events, the best event to see is the Opening Ceremony. While you do have an assigned seat, I wouldn’t expect to sit in your assigned seat. You will need the ticket to get into the appropriate gate. 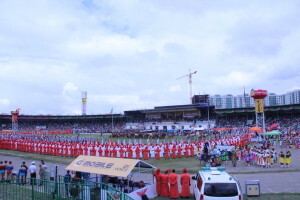 The Opening Ceremony lasts for about an hour, and the stadium will be completely sold out. Everyone is dressed in bright colors. There is a lot of dancing and people doing tricks on horses. 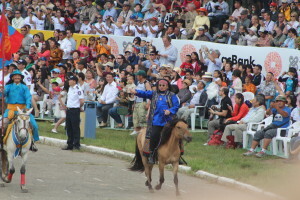 We even saw the “Bon Jovi of Mongolia,” who came riding in on a horse. From our research and conversations with everyone, they all mentioned that the closing ceremony is fairly bland. The wrestling is composed of 512 wrestlers. If they can’t get enough contestants, they will fill the gap with people from the military. It is a single elimination tournament where the loser is the first person to get taken down. The contest is un-timed and can go surprisingly long (e.g., 20+ min) The first 2 or 3 rounds were held immediately after the opening ceremony. 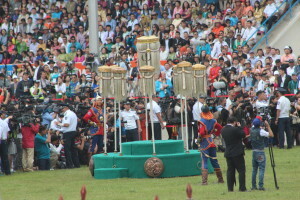 After a victory, the loser walks under the arm of the victor, who is holding his arm up and does various other ceremonial activities. Rounds 4, 5, and 6 are held early on the morning of the 12th with the final rounds (7, 8, and 9) taking place in the afternoon. We personally only watched the 1st round and the last three rounds. It can get tedious after a while. Winners of the 7, 8, and 9 rounds earn the title of Falcons, Elephants, and Lion. The winner gets a car, cash, and a free apartment for a year. Wrestling is huge in the city and a great experience. 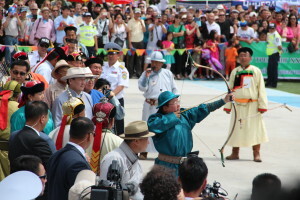 Close to the National Stadium is a stadium for archery. 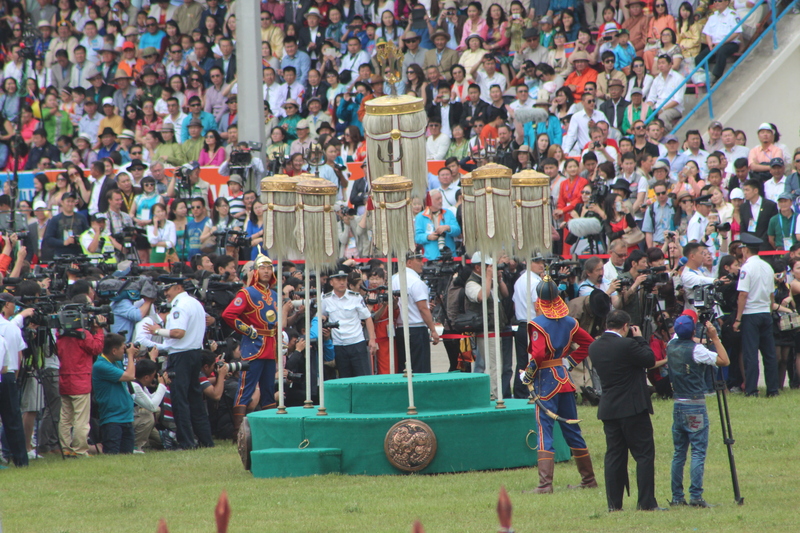 When we got there, we saw the President of Mongolia, which was pretty cool. 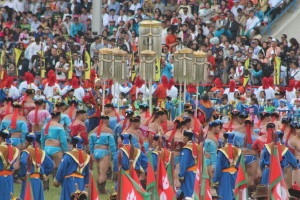 Both men and women compete in the competition. They shoot far away and try to knock down these little balls of hay. As time goes by, the amount of hay bails shrinks. It was pretty impressive to see their skills. We were here for about an hour or two before leaving. The horse racing occurs outside of the capital. 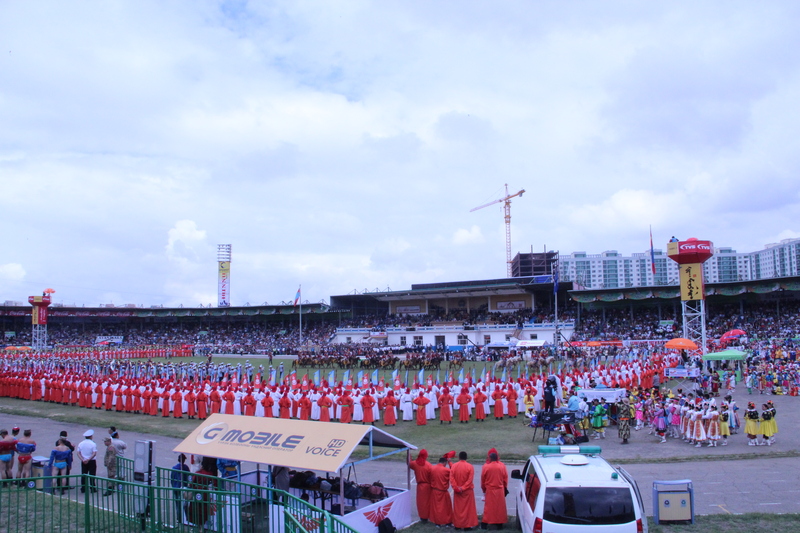 There are free buses that will take you out to the event or you should hire a private taxi. 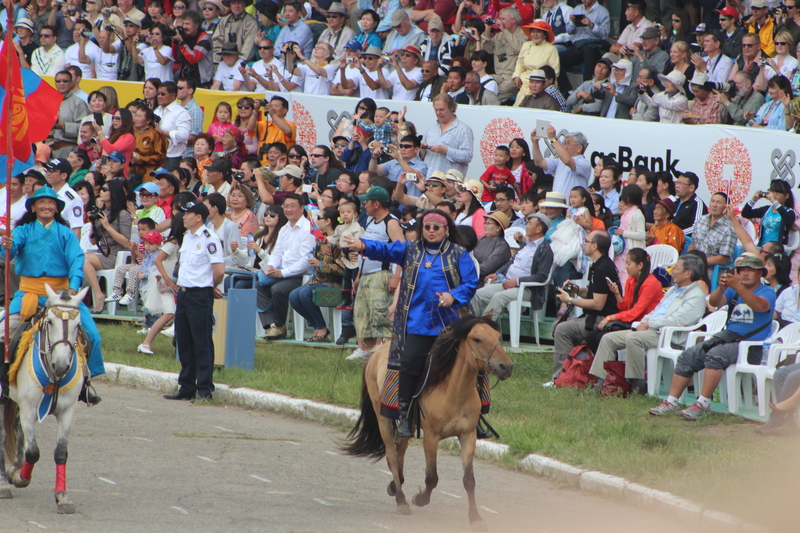 We ended up seeing the horse racing at a Local Naadam and decided to not make the trip to the horse racing. I believe the typical race is 17 km long. As you could imagine, the majority of the race isn’t that exciting even if they do have TV monitors. It is impressive seeing little kids riding at full speed, but it is not paramount. 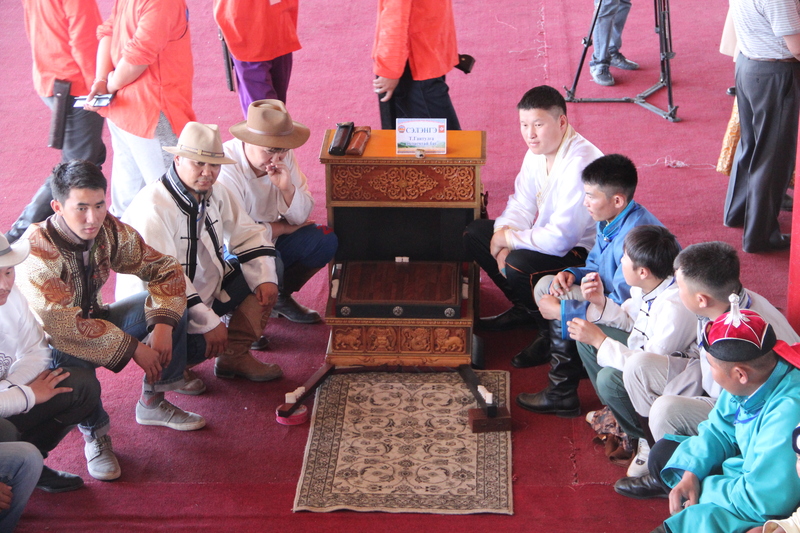 One of the new events at Naadam is ankle bone shooting. There are two teams, whose goal is to flick a piece of cow hide and knock down little sheep ankle bones that are located about 5 meters awa. The first team to a certain number of points wins the competition. The stadium is located right behind the archery stadium. 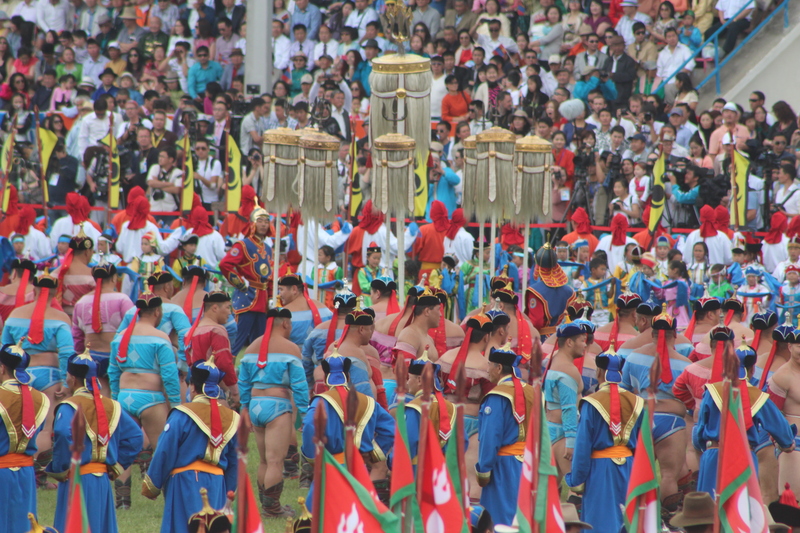 The Naadam Festival is truly amazing, and I highly recommend it to anyone traveling to Mongolia. The weather in July is perfect, and it is a unique experience. 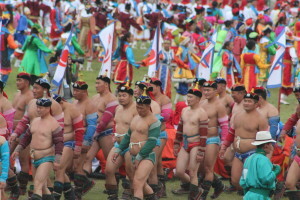 I would try to see a combination of a Local Naadam and the main national Naadam. 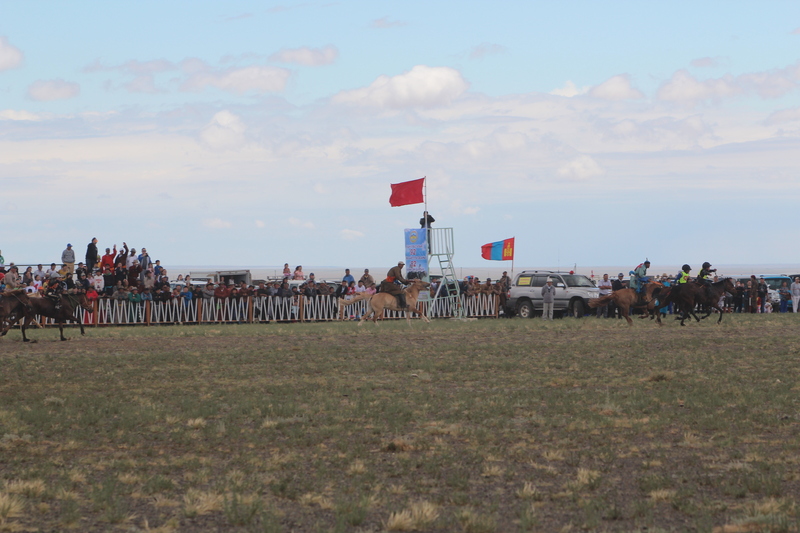 If you are doing a tour of the Gobi Desert or another location, you should ask the guide/driver if there is a local Naadam. 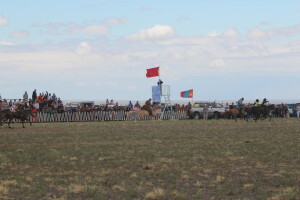 When we were in the Gobi desert from 8th – 10th, Dalanzadgad (main city around Gobi) had a local Naadam that was occuring before the National Naadam. Should I hire a guide or not? The advantages of hiring a guide are that you will have a much better understanding of the different events and the ceremonial practices. The downside is that you are on the schedule of the group. As mentioned earlier, many of these events can become very tedious. Do you really want to see 256 wrestling matches from a distance of 50 yards away? The best case scenario is that you would have a budget that would allow you to hire a private guide. My personal opinion is to try and do both. 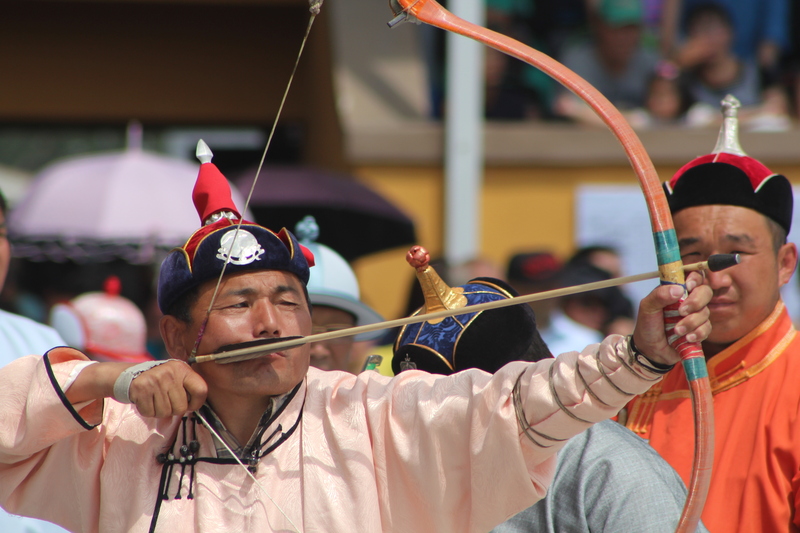 You are most likely spending sometime in Mongolia outside of the National Naadam, and thus, you should have the option of doing a local Naadam for a day. 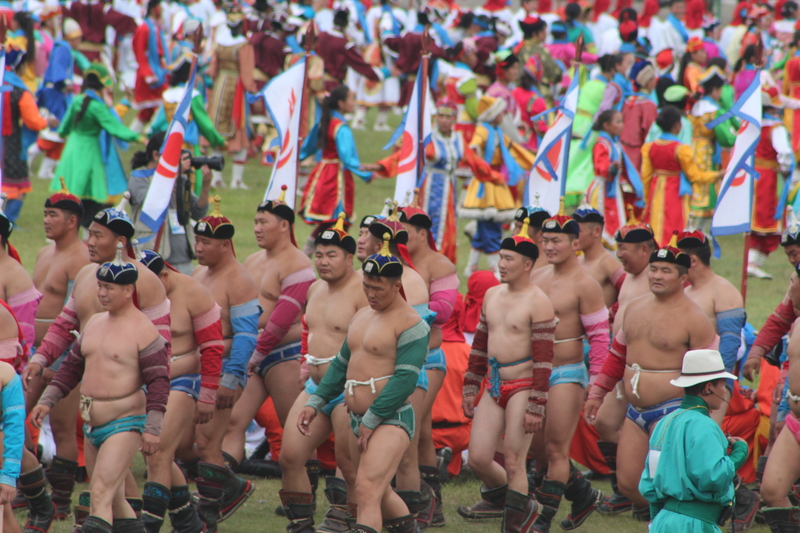 The main advantage of a local Naadam is that you are a lot closer to the action. Some people in online forums even suggest that you are even invited to participate in some fashion. My opinion is to try and do both. What is going on outside of the main sporting events? Outside of the National Stadium, there are a lot of opportunities to eat local food and play games. 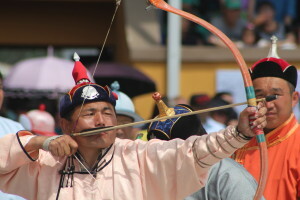 (e.g., throw darts at balloons) On the last day, they also have a big concert in the square with the top acts of Mongolia. At the end of the concert, they shoot fireworks. You will also have plenty of time to experience the capital in between events. Overall, we felt very safe walking around the capital and checking out the National Museum.